The swimming pool service contractors from Express Pool Care in Goodyear, Arizona know that cleaning and maintaining a fiberglass swimming pool is one of the easiest to perform. There are benefits of fiberglass swimming pools and ease in cleaning and maintenance and the low risk of algae growth are two reasons to consider a fiberglass pool project. Fiberglass swimming pools require fewer chemicals to keep them clean than concrete or vinyl liner pools and this appeals to many pool owners who would like to swim in water that has fewer chemicals used to keep it free from bacteria. Fiberglass pools are the second most expensive pool style when it comes to construction, but it may pay for itself in the long-term because it won’t get rips or tears, uses fewer chemicals and won’t need to be replastered. Unlike a concrete pool which can change the chemistry of the water, a fiberglass pool doesn’t have that potential. Fiberglass pools are easier to clean because of their smooth surface. This smooth surface makes it harder for algae to take hold and grow and bloom in the water. If you want to have a swimming pool constructed in a short amount of time, a fiberglass pool, again, is your best bet. A fiberglass pool, because the shell is delivered to your home in one piece — like a big bathtub — usually only takes about two weeks from excavation to swim time! 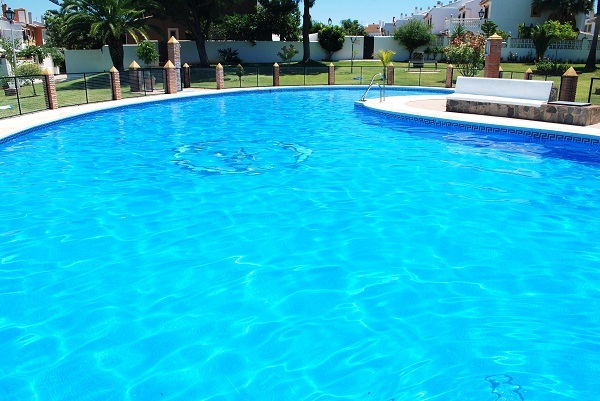 Potential Arizona swimming pool owners should take all factors into consideration before choosing a pool construction material and ease of use and the idea that it may cost less to have a fiberglass pool maintained, should be factors.